Scooper - Technology News: Who are the future consumers of South-East Asia? Who are the future consumers of South-East Asia? As business leaders convene for the Kuala Lumpur meeting of the World Economic Forum , they have many uncertainties to ponder, from the trajectory of China’s economy to whether the new ASEAN Economic Community (AEC) launched at the start of the year will vault South-East Asia up to a new level of economic dynamism. Demographics and the granularity of growth needs to be part of their thinking. The question today is not so much where to find entire growth markets, but which specific demographic groups have the most potential? Radical demographic shifts are transforming consumer markets around the world. In the past, market growth was fuelled largely by expanding populations; today, incomes are the force to reckon with. In South-East Asia, two-thirds of consumption growth in the period to 2030 will come from increasing per capita spending, and the remaining one-third from population growth. This increase is not uniformly distributed; it is therefore vital that consumer-facing companies in the region develop much more granular growth strategies, identifying pockets of higher income and population growth. Companies need to know which consumers have the most purchasing power, what they are likely to spend on, and where they live. In an ageing world, South-East Asia is fortunate that it continues to benefit from both robust population growth and sharply rising incomes. In combination, these two forces should help to sustain strong consumption growth, fuelling the continued expansion of GDP. 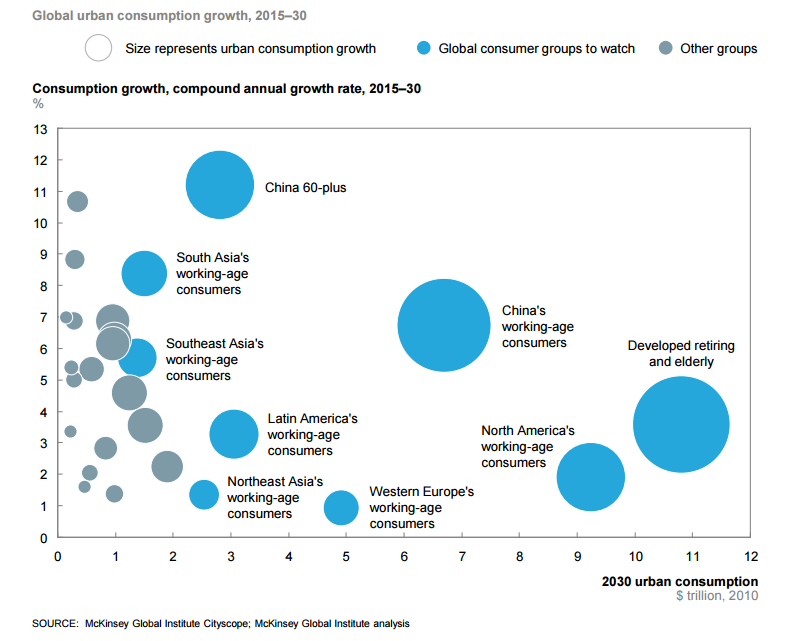 In every age group, the region’s population growth rate will be faster than the global average, and will contribute 34% to consumption growth by 2030, compared with the global figure of 25%, according to a new McKinsey report Urban World: The Global Consumers to Watch . While South-East Asia’s working-age population will continue to rise faster than the global average, contributing nearly 70% of consumption growth in the region, elderly consumers are a group to watch; their numbers are growing the fastest of any age group at around 5% a year. Between now and 2030, there will be nearly 20 million more people aged 60 and over in the region. Worldwide, this age group is the most important consumer growth market over the next 15 years. We are already seeing the extraordinary spending power of the elderly in developed economies. For example, people aged over 50 bought nearly two-thirds of the new cars sold in the United States in 2011. Companies will need to stay ahead of key demographic trends, building richer sources of insight than offered by their current marketing profiles. They will need a detailed portrait of target customer groups, including trends in key life events such as when people get jobs, get married and have children. Consider that a drop in the share of young married households in the United States in recent years fully explains why home ownership in that economy has fallen. Companies also need to pinpoint where their growth will come from. The answer, increasingly, is the urban world. Ninety-one percent of global consumption growth in the next 15 years will be in cities. In ASEAN economies, the number of people living in cities with more than 200,000 inhabitants is set to grow by more than 90 million between 2012 and 2030. And the number of urban households with sufficient incomes to spend on discretionary goods and services is expected to double. Indonesia stands out for its strong expansion of this “consuming class”, with the number of households at these income levels growing from 34 million in 2013 to 74 million in 2030. But which cities? Worldwide, demographic profiles – and therefore consumption prospects – are already surprisingly large even within countries. In 2012, difference in median age between the youngest and oldest cities in the US was more than 20 years. In more homogenous, smaller countries such as South Korea and Spain, the difference was 10 years. In South-East Asia, cities in the Philippines, for instance, tend to be dominated by the young, while some cities in Thailand and Singapore are ageing rapidly. The top five cities for consumption are, perhaps unsurprisingly, expected to be Jakarta, Kuala Lumpur, Manila, Singapore and Bangkok. But it is small and medium-size cities in the ASEAN area that will drive future economic growth. In Indonesia, for instance, some relatively small cities are becoming growth hot spots. Gresik in the East Java province of Indonesia is a case in point: the city has only about 1.2 million inhabitants but nearly 60% of them are in the consuming class. Discretionary spending is 12% higher than the Indonesian urban average. When you look at the most promising markets for specific products, small and medium-size cities that may not be familiar to many Western companies feature prominently. In the case of detergent, for instance, Cebu and Davao in the Philippines and Bien Hoa in Vietnam feature in the top 10 cities in the ASEAN region. Cebu also appears in the top 10 for sales of diapers, along with another Philippines city, Cagayan de Oro, and Bekasi in Indonesia. To compete in South-East Asia, businesses need to assess how prepared they are for arguably one of the most diverse consumer markets in history. The days of market growth fuelled by rising populations are coming to an end. Companies will need to be much more sophisticated, precise and strategic in their growth strategies, to keep pace with evolving urban demographics.